Last week a friend asked me to recommend a new movie for him and his wife to see at the cinema this week. I told him that there’s nothing worth seeing and he’s better off watching something on Netflix. Both ROBIN HOOD (2018) and THE NUTCRACKER AND THE FOUR REALMS arrived at our cinemas today but neither is worth your time and money. So what’s worth watching this week on Netflix, you ask? Check out I DON’T FEEL AT HOME IN THIS WORLD ANYMORE. It won the Grand Jury Prize at Sundance last year. I DON’T FEEL AT HOME IN THIS WORLD ANYMORE. 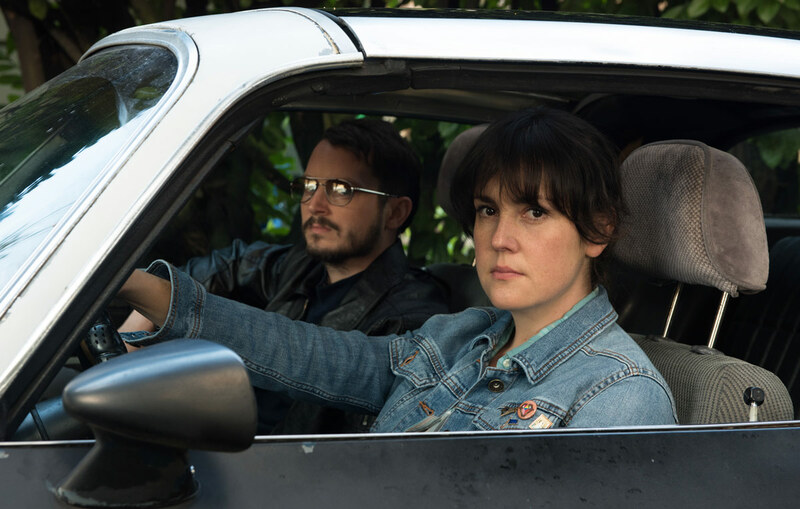 (yes, with the full stop at the end) tells the neo-noir story of Ruth Kimke (Melanie Lynskey, TV’s TWO AND A HALF MEN), a drab, 30-something year-old nursing assistant who has essentially become invisible to everyone around her. Her neighbour uses her front yard as a dumping ground for his dog, people cut in front of her in the supermarket checkout line, and she can’t even pick up the nerdiest guy in a bar (played by the film’s writer-director, Macon Blair). After someone breaks into her home, stealing her laptop and grandmother’s silverware, and getting little sympathy or support from the police, Ruth decides she’s had enough and she recruits her nunchaku-swinging, loner neighbour, Tony (Elijah Wood, THE LORD OF THE RINGS trilogy), to help recover her belongings. But in their attempt to right some wrongs, Ruth and Tony bite off a bit more than they can chew. Blair’s first feature is a kooky blend of genres in the style of the Coen brothers as the film starts off light and fun, and turns rather dark in the third act. I would have preferred that the film maintain its quirky tone throughout but this way isn’t bad as the director manages to hold it together long enough to make it to the film’s end. Lynskey is well cast as a kinder and gentler William Foster. As she tells one of her victims, she doesn’t want vengeance. She only wants “people to not be assholes!” It’s that naiveté that lands her and Tony in hot water when they take on the real bad guys. Wood is equally amusing as Ruth’s asocial, rat-tailed, ninja-wannabe neighbour. Like Ruth, Tony also longs to feel important and noticed, and has his own share of pent-up rage that needs venting. The two would make for a good sitcom team of amateur vigilantes, giving the world’s “me-first” jerks the kick in the pants that they sorely deserve. I DON’T FEEL AT HOME IN THIS WORLD ANYMORE. is available now on Netflix. It’s not a perfect film but for a first film is pretty darn enjoyable. Check it out! And next week, I’ll be back with some cinema films – good ones too! Watch the review recorded on Facebook Live on Friday, November 30th at 8:30 am HK time!